For our cartoon today we return to Grandma, a strip by Charles Kuhn that ran from 1947 to 1969. This particular strip ran on March 18, 1955. It perpetuates a common myth. There is no direct connection to getting a cold from having cold feet. It turns out that the rhinovirus (the cold virus) does do better in cooler temperatures, so that if the inside of your nose is cooler the virus can take off. And if you have cold, wet feet that can possibly chill you and thereby chill the inside of your nose. Except that if you have cold, wet feet you are probably in conditions where all the rest of you, including your face, is also cold and wet. But if you have cold, wet feet and the rest of you, including your nose, is warm and toasty, you are not more susceptible. You can read more in my blog entry, The Germs Have Eyes, which includes references. Well, things are turning cold around here. So that means I need a reminder of warmth and summer. And there’s no better way that to show a strip from Red and Rover, a retro strip that looks at 11-year-old Red (Russell McLean) and his dog Rover. The strip is set in the late-1960s/early-1970s. And that means that Red (Rover, too) was barefoot a lot. This strip appeared on July 7, 2010. The joke doesn’t involved bare feet—they’re just part of the way things are. They are also very handy for climbing trees, though. How else are you going to get a good grip? Here’s a very old strip, published July 5, 1951. It’s from Muggs and Skeeter by Wally Bishop. Back then before they were brainwashed, kids liked going barefoot so much that devious adults would take advantage of it. 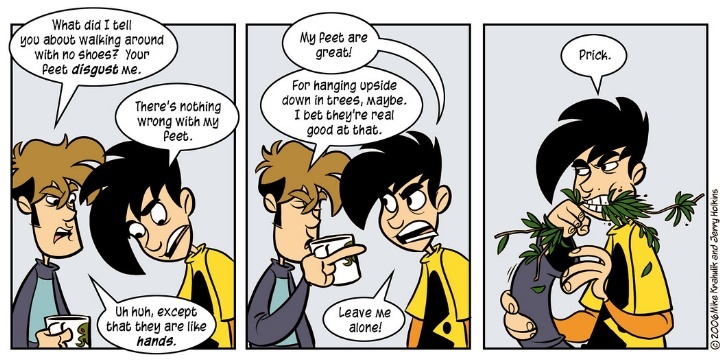 Today we feature a comic from Penny Arcade, which is a webcomic that concentrates on the video game culture. This comic appeared on September 1, 2006.